The Rajah Pub Table is designed to be both rustic and elegant. 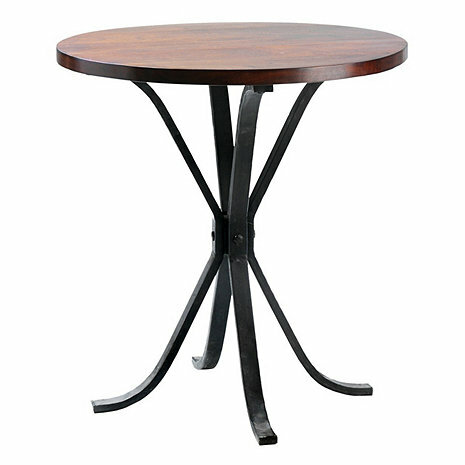 Made of thick acacia hardwood and hand forged iron, it is built to last a lifetime. It's sleek, yet practical styling is a perfect fit for most any environment. which stools do u recommend to go with this table? Where is the Rajah Pub table manufactured/produced? Is it solid Acacia Wood all the way through r are there any veneers or non-wood composed in the Top? BEST ANSWER: It is solid Acacia wood throughout, and the base is a black iron..certainly not light in color in any way. Thanks! Phone operator was great, great packaging for shipping, beautiful solid iron base with rich, dark wood top. Worth every penny! This table is well made, beautiful and elegant. We love it!